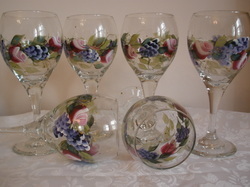 By far my most popular item is my wine glasses. It is so hard for me to see a plain glass as it is calling out for some beauty. Just as we love to add elegance & charm to ourselves through jewelry and makeup, so do my glasses. I add lots of extra details in gold & whimsy to add that extra little bit of romance to them. 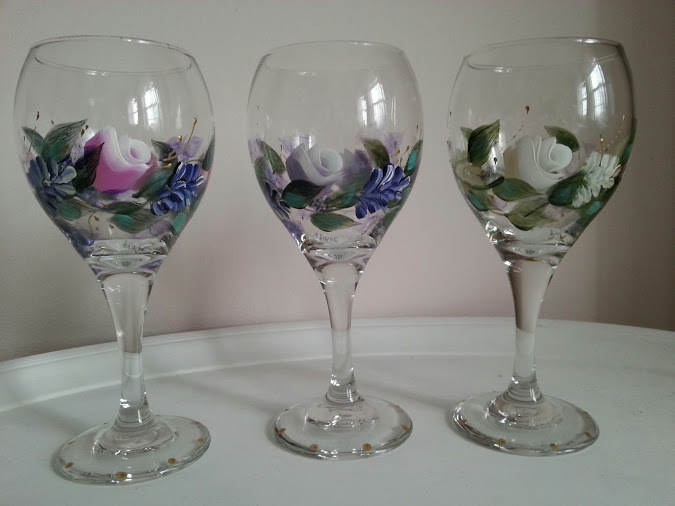 You will enjoy drinking your wine and any other beverage in it as these are definitely for using not for sitting in the pretty china cabinet!! All my designs are OOAK (one-of-a-kind), original designs and free hand painted my myself the artist, no stencils used. 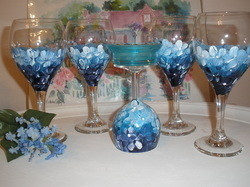 Hydrangeas in such pretty blues!! One of my favourites flowers after the pink rose!! The item in the middle is a tealight holder!! 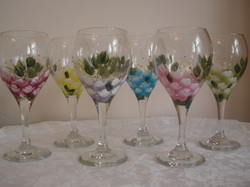 A use for those odd shaped small glasses that are waaayyyy to small for any amount of wine :) !! I love this series as it incorporates my favourite colours so beautifully together. Bud wreaths... very elegant and so pretty to dress up your summer table!! 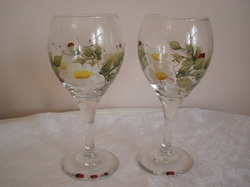 Beautiful gift for the new bride or house warming present with a bottle of summer wine!! or for yourself to entertain your book club with!! Rosebud Bouquet!! Each guest has their color of choice! The ultimate summer design - light, airy with a bit of whimsy! !